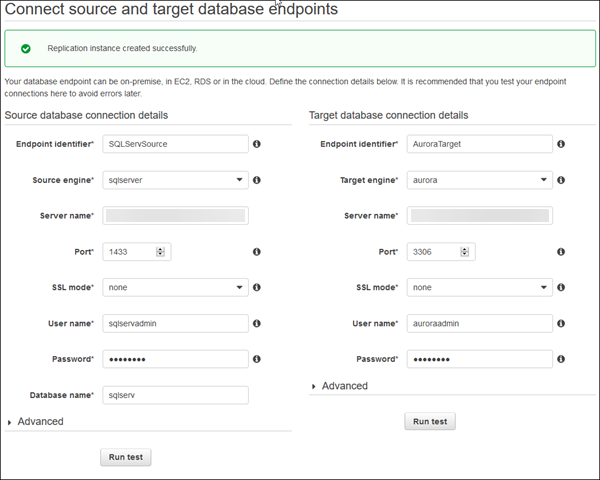 While your replication instance is being created, you can specify the source and target database endpoints using the AWS Management Console. However, you can test connectivity only after the replication instance has been created, because the replication instance is used in the connection. In the AWS DMS console, specify your connection information for the source SQL Server database and the target Aurora MySQL database. The following table describes the source settings. Type a name, such as SQLServerSource. Provide the SQL Server DB instance server name. Type the port number of the database. The default for SQL Server is 1433. Type the name of the user you want to use to connect to the source database. Provide the SQL Server database name. Extra parameters that you can set in an endpoint to add functionality or change the behavior of AWS DMS. A few of the most relevant attributes are listed here. Use a semicolon (;) to separate multiple entries. safeguardpolicy - Changes the behavior of SQL Server by opening transactions to prevent the transaction log from being truncated while AWS DMS is reading the log. Valid values are EXCLUSIVE_AUTOMATIC_TRUNCATION or RELY_ON_SQL_SERVER_REPLICATION_AGENT (default). useBCPFullLoad - Directs AWS DMS to use BCP (bulk copy) for data loading. Valid values are Y or N. When the target table contains an identity column that does not exist in the source table, you must disable the use of BCP for loading the table by setting the parameter to N.
BCPPacketSize - If BCP is enabled for data loads, then enter the maximum packet size used by BCP. Valid values are 1 – 100000 (default 16384). controlTablesFileGroup - Specifies the file group to use for the control tables that the AWS DMS process creates in the database. Type a name, such as Auroratarget. Provide the Aurora MySQL DB server name for the primary instance. Type the port number of the database. The default for Aurora MySQL is 3306. Type the name of the user that you want to use to connect to the target database. The following table describes the advanced target settings. Extra parameters that you can set in an endpoint to add functionality or change the behavior of AWS DMS. A few of the most relevant attributes are listed here. Use a semicolon to separate multiple entries. targetDbType - By default, AWS DMS creates a different database for each schema that is being migrated. If you want to combine several schemas into a single database, set this option to targetDbType=SPECIFIC_DATABASE. initstmt - Use this option to invoke the MySQL initstmt connection parameter and accept anything MySQL initstmt accepts. For an Aurora MySQL target, it’s often useful to disable foreign key checks by setting this option to initstmt=SET FOREIGN_KEY_CHECKS=0. After the endpoints and replication instance are created, test the endpoint connections by choosing Run test for the source and target endpoints. During the full load process, AWS DMS does not load tables in any particular order, so it might load the child table data before parent table data. As a result, foreign key constraints might be violated if they are enabled. Also, if triggers are present on the target database, they might change data loaded by AWS DMS in unexpected ways. If you dropped foreign key constraints and triggers on the target database, generate a script that enables the foreign key constraints and triggers. Secondary indexes (as with all indexes) can slow down the full load of data into tables because they must be maintained and updated during the loading process. Dropping them can improve the performance of your full load process. If you drop the indexes, you must to add them back later, after the full load is complete.